Quite simply, to provide all the nutrition needed in the first few months of life. After that, solid foods slowly take over from it, until the transition has been made to an adult diet. And what animal is the milk we drink designed to provide the perfect nutrition for? You may think it’s a trick question, but it isn’t. The answer, of course, are calves if it’s cow’s milk. Or kids, if it’s goat’s milk. Have you ever sat back and thought how strange this sounds? That humans are the only animals to continue drinking milk into adulthood, when all other animals are on an adult diet and milk free. That we place such importance on a food that’s designed for the offspring of a completely different animal. 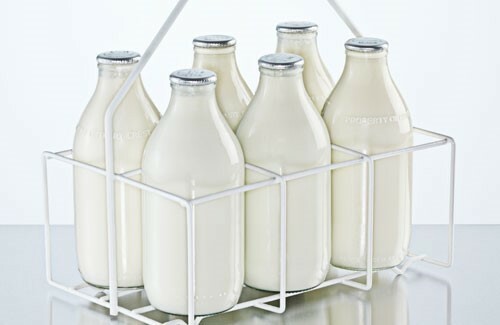 The most common response we hear from patients is that milk is high in calcium, needed to make strong bones. Interestingly this belief dates back to the 1930’s, although it wasn’t until the 1970’s and 1980’s that adverts by the Milk Marketing Board really made their mark. Many people still remember the “lotta bottle: nice cold, ice cold milk” adverts from the early 1980’s. While it may be true to say that milk is high in calcium, this misses two crucial points. The first – and one we see most often – is that cow’s milk is difficult for us to digest. It contains much higher levels of lactose than human milk, as well as the molecules being much larger. Interestingly, sheep’s and goat’s milk is slightly less problematic, as it’s much closer to human milk in its make up. This means that we simply don’t have the digestive bacteria and enzymes necessary to be able to fully digest it. And it’s the reason that increasing numbers of people are being diagnosed with lactose intolerance. Symptoms can range from mild bloating and indigestion to the most severe vomiting, diarrhoea and flu like symptoms. The second – and linked to the first – is that just because a food is high in a particular nutrient, it doesn’t automatically mean that we can fully absorb it. Again, this is partly down to us not being able to fully digest it. But this isn’t the whole story. The most important thing to remember is that vitamin D is also needed to be able to absorb – and use – calcium. What this means is that if you don’t have the necessary amount of vitamin D, then you won’t be able to absorb the calcium, regardless of how much of it you eat / drink. So where does vitamin D come from? Well, from foods such as fatty fish and eggs. However, it’s also produced in the skin as a result of exposure to natural sunlight. Interestingly, more vitamin D comes from sunlight than the diet. So if you don’t spend much time outside – regardless of the time of year – you’re missing out on an essential nutrient. Oh and if you’re slathering your skin in sunscreen when you are outside, then your body won’t be able to produce vitamin D either. As an aside vitamin D has many other uses as well. These include a healthy immune system, cell growth and reducing inflammation. So, if milk isn’t the best source of calcium, what other foods should we be eating instead? Well, there are plenty of options. Green leafy vegetables. Pulses and beans. Almonds. Oranges. Blackstrap molasses. Sea fish and sea weed. Always remember that, generally, plants are much easier for us to digest than meat. So the maximum uptake of nutrients will always be from plant related foods. This, of course, assumes that they haven’t been genetically modified, but this is a subject for another day! Sadly, milk is also linked to an ever growing list of health issues. Milk encourages the production of catarrh – or snot, if you prefer (!) – and so can play a part in many respiratory problems from a persistent blocked nose and glue ear to asthma and bronchitis / pneumonia. It also tends to exacerbate eczema in children. It’s been linked to many bone problems, including arthritis and osteoporosis. Milk also raises IGF – Insulin like Growth Factor – which plays a part in Type II Diabetes; as well as breast, prostate and colorectral cancers. Lastly it’s been linked to cardiovascular disease. So are we saying that milk should be avoided altogether? No, of course not. What you eat and drink is always up to you. What we are suggesting is that milk – and dairy products generally – should only form an occasional part of your diet. If you miss your cheese fix, try goat’s or sheep’s cheeses instead. If you take nothing else away from this post, use it as yet another reminder not to automatically believe everything you hear – no matter where it comes from or how reasonable it sounds. And that includes what we say too. Always check up for yourself.